The setting sun glistens on the water of Elliott Bay; in the distance you can see the snow-capped Olympic Mountains; you can hear the bustle of the city and see the sun reflected in the skyscrapers of the Seattle skyline. 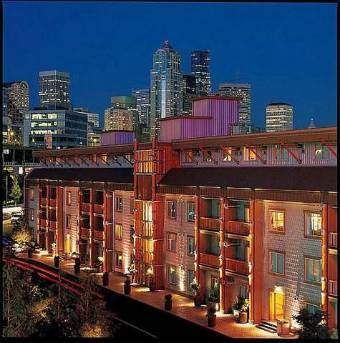 There is only one hotel that combines the spectacular vistas that the Seattle area offers with the convenience of being right downtown, and on the waterfront – The Edgewater Hotel. Whether you’re planning on shopping in the trendy Belltown neighborhood, taking the elevator to the top of the Space Needle, or shopping for fresh fish at Pike’s Place Market, The Edgewater Hotel is a comfortable, centrally located hub for your days of adventure. The Edgewater is about five minutes away from all of these tourist spots, in addition to the activities that are available on Elliott Bay. And, if you need guidance planning your days in Seattle, The Edgewater has a helpful concierge to take the headaches out of organizing it all. Though The Edgewater is great for putting you right in the midst of it all so you can go explore Seattle, it is also a cozy place to hang around on your down days. The décor is decidedly “pacific northwest luxury,” with river-rock gas fireplaces, plush comforters and knotty pine furniture. And from the comfort of this luxury you can look out on Elliott Bay. The Edgewater’s signature restaurant Six Seven boasts floor to ceiling windows overlooking Elliott Bay. On cool days you can eat food prepared by a gourmet chef while you look out at the bay with the warmth of a fireplace nearby. If you happen to luck out and catch the Seattle sun (July and August are best) you’ll see what all of the locals rave about. Though Seattle is gray for much of the year, when the sun shines the city comes alive and is positively glorious. You’ll definitely want to be outside on The Edgewater’s deck overlooking Elliott Bay watching the ferries come and go. Or take a short cruise ride around Elliott Bay yourself!If you’re traveling with kids, the best thing about The Edgewater is that it provides luxury in a comfortable, relaxed way. In the rustic atmosphere you won’t have to worry about the kids breaking a precious crystal vase or scratching valuable antique furniture. Both you and the kids will be comfortable. The Edgewater’s amenities even include a rubber ducky in every bathtub. The Edgewater also has several deluxe suites that provide more space for families. You could even stay in the room where the Beatles stayed during their 1964 United States tour. It is the small touches, though, that can really make a luxury hotel stand out, and at The Edgewater every last detail is looked after. Valet parking is free (a must in the often-congested downtown area), rooms are equipped with large flat-screen TV’s, and Starbucks coffee is complimentary. If you’re looking for luxury, convenience and fabulous views in a kid-friendly package, you really can’t do much better than to book a room at the Edgewater Hotel. Back from the Edgewater Hotel.